The Squeaky Door: 38 and fresh as ever! (c) Michelle Moloney King. Loving the style! Everything you ever wanted to know about Sally Nichols, Alexis Deacon, Jutta Bauer, Éilís Ní Dhuibhne, eco children's literature, selling children's books to adults, the last Artemis Fowl, the latest David Almond, the first Girl who Circumnavigated Fairyland and much, much more all brought to you by a host of brilliant contributors (if I say so myself). For a sneak peek, click! 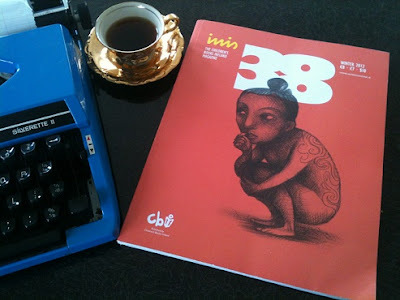 Glad you like the picture, I love my new (old) blue typewriter and Inis, of course!